The walls are up and primed. It's time to start the fancy stuff! Hooray! We wanted to make the dining room a little more interesting and set it off from the other rooms. 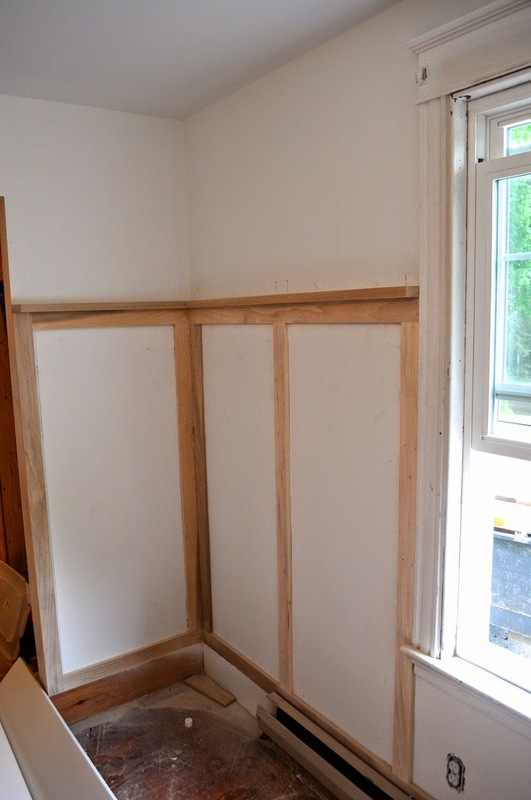 We decided to create a traditional wainscot detail, complete with a plate rack across the top. The approach works well in our room, we just needed to figure out how to lay it out. 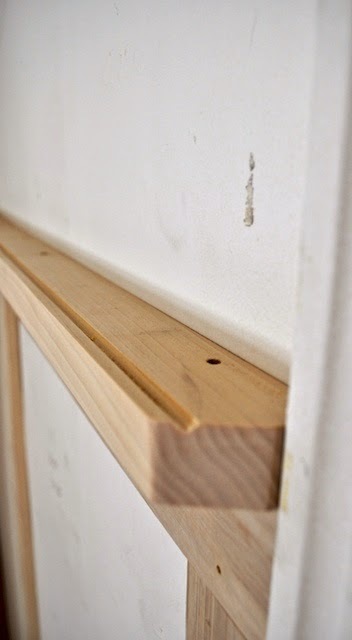 We started by determining the height of the plate rail. We decided to make it out of 5/4 lumber, 2" deep, with a plate groove routed along the edge. 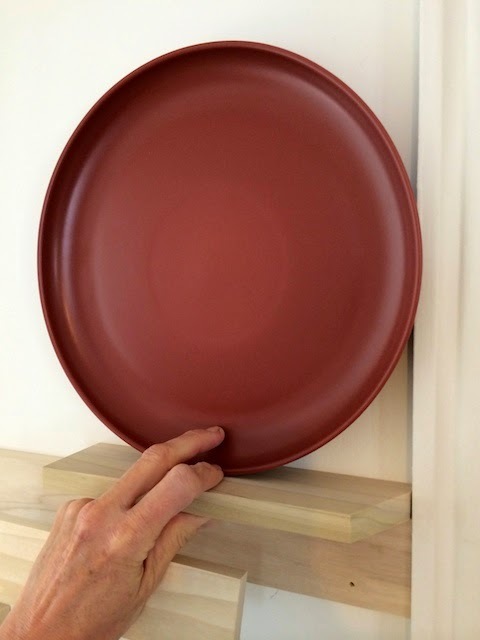 We tried it out with a real plate, to make sure we got all the dimensions right! (and I really love these plates - $3 on clearance at the Crate and Barrel outlet). We'll be painting it white (to keep the room nice and bright), so Kyle used poplar, because of its dimensional stability and ease of cutting/planing/etc. 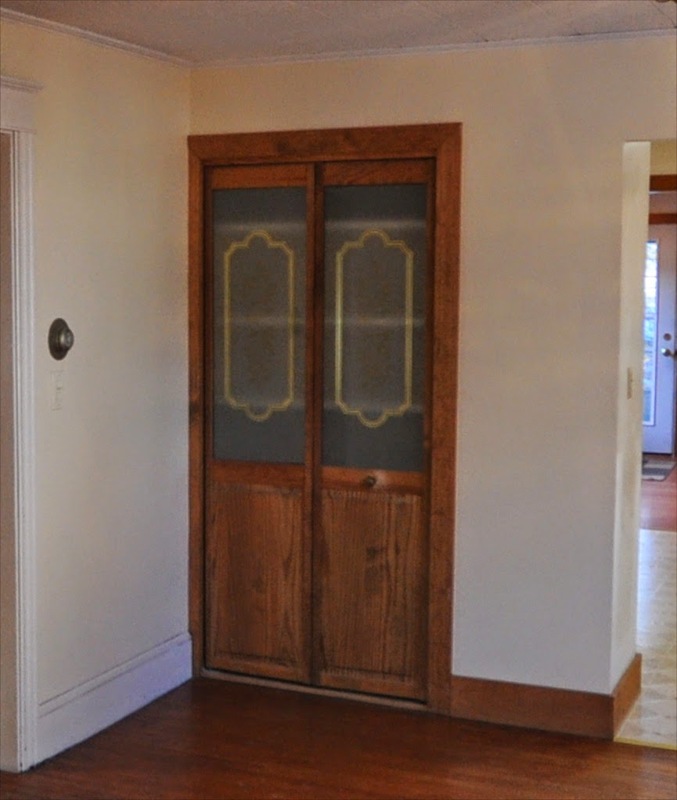 We want to stay true to the original house as much as possible, so we were thrilled to use the original casing to trim around the opening. We already had a closet in the dining room - but decided we could make it much more attractive. So we got to work designing a built in china hutch. The drawer base was rescued from a previous project and the guys modified it to fit the opening. Kyle created a birch paneling 'box' for the top. And our electrician, Steve, wired it up with halogen lights and a USB charging station (yes, we love those things!!!). 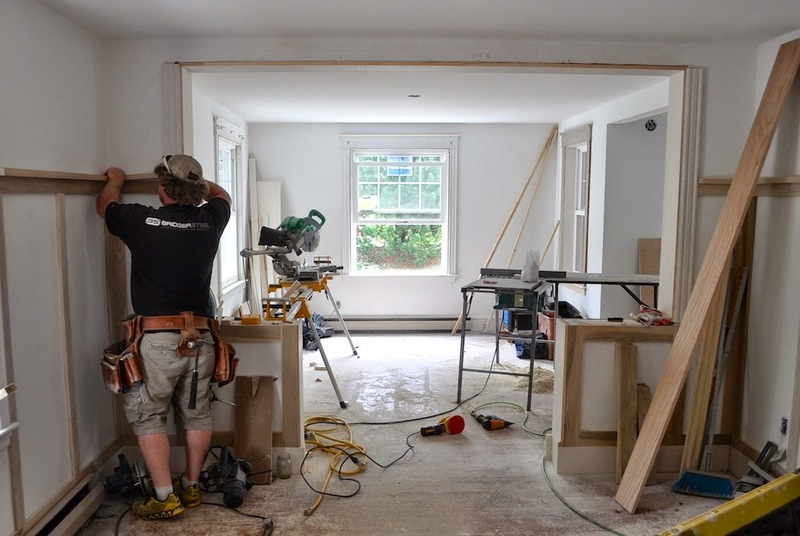 When we get it finished, it will have a traditional look, with modern conveniences. Next up: We're going to start on the staircase and the colonnades. So lots more woodwork to come! EEEEEEEEEEEEEeeeeeeeeeeeeee! I love it all! 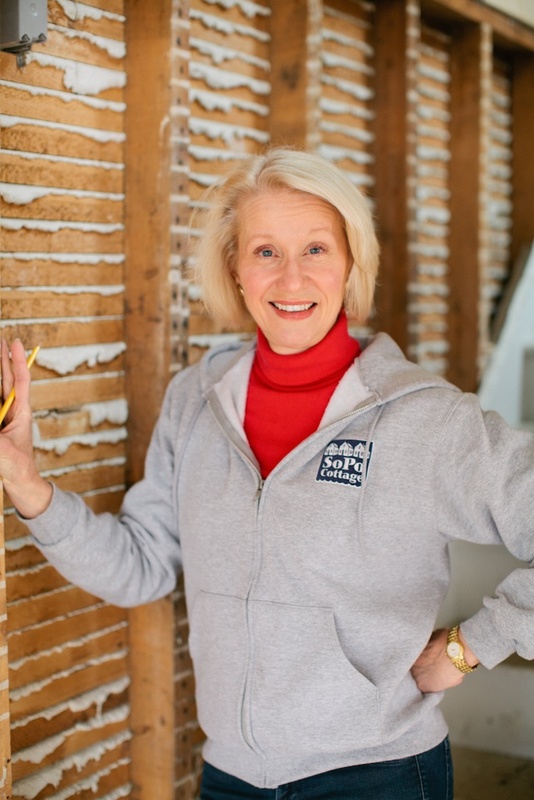 I am adding plate molding to my Eatery/former butler's pantry, too! I got an idea of how high to put it from this post! It's looking great!! 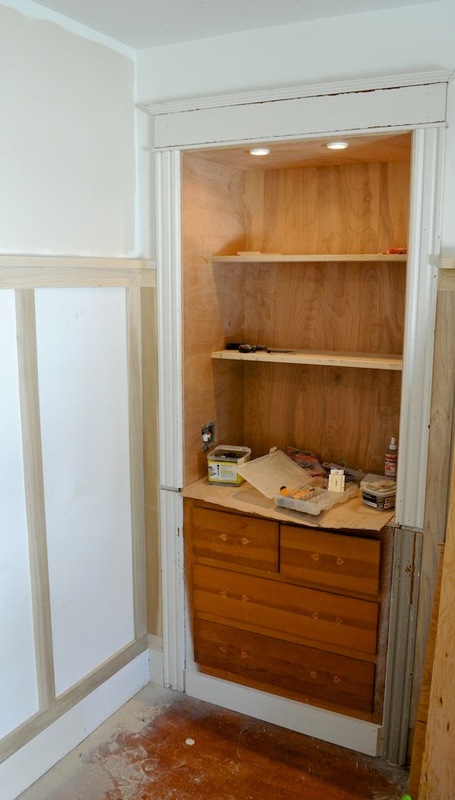 Turning that closet into a china hutch was genius, and I'm so loving the wainscoting!